This article is about the Japanese word for the fox. For other uses, see Kitsune (disambiguation). Kitsune (狐, キツネ, IPA: [kitsɯne] ( listen)) is the Japanese word for the fox. Foxes are a common subject of Japanese folklore; in English, kitsune refers to them in this context. Stories depict them as intelligent beings and as possessing paranormal abilities that increase with their age and wisdom. According to Yōkai folklore, all foxes have the ability to shapeshift into human form. While some folktales speak of kitsune employing this ability to trick others—as foxes in folklore often do—other stories portray them as faithful guardians, friends, lovers, and wives. Foxes and humans lived close together in ancient Japan; this companionship gave rise to legends about the creatures. Kitsune have become closely associated with Inari, a Shinto kami or spirit, and serve as its messengers. This role has reinforced the fox's supernatural significance. The more tails a kitsune has—they may have as many as nine—the older, wiser, and more powerful it is. Because of their potential power and influence, some people make sacrifices to them as to a deity. Japanese fox myths had their origins in Chinese mythology. Chinese folk tales tell of fox spirits called húli jīng (Chinese: 狐狸精) that may have up to nine tails (Kyūbi no Kitsune in Japanese). Many of the earliest surviving stories are recorded in the Konjaku Monogatarishū, an 11th-century collection of Chinese, Indian, and Japanese narratives. The nine-tailed foxes came to be adapted as a motif from Chinese mythology to Japanese mythology. 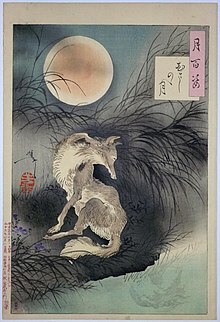 Smyers (1999) notes that the idea of the fox as seductress and the connection of the fox myths to Buddhism were introduced into Japanese folklore through similar Chinese stories, but she maintains that some fox stories contain elements unique to Japan. Early Kamakura period Mizukagami indicates that it means "came (ki) [ perfective aspect particle tsu] to bedroom (ne)" due to a legend that a kitsune would change into one's wife and bear children. Ōtsuki Fumihiko in Daigenkai (1932–1935) proposes that the word comes from kitsu, which is onomatopoeia for the bark of a fox, and ne, which may be an affix or an honorific word meaning a servant of an Inari shrine. Nozaki also suggests that the word kitsune was originally onomatopoetic. Kitsu represented a fox's yelp and came to be the general word for fox. -Ne signifies an affectionate mood. Kitsu is now archaic; in modern Japanese, a fox's cry is transcribed as kon kon or gon gon. "You may be a fox," Ono called after her, "but you are the mother of my son and I will always love you. Come back when you please; you will always be welcome." Because the fox returns to her husband each night as a woman but leaves each morning as a fox she is called Kitsune. In classical Japanese, kitsu-ne means come and sleep, and ki-tsune means always comes. Kitsune are believed to possess superior intelligence, long life, and magical powers. They are a type of yōkai; the word kitsune is often translated as fox spirit. However, this does not mean that kitsune are ghosts, nor that they are fundamentally different from regular foxes. Because the word spirit is used to reflect a state of knowledge or enlightenment, all long-lived foxes gain supernatural abilities. On the other hand, the yako (野狐, literally field foxes, also called nogitsune) tend to be mischievous or even malicious. Local traditions add further types. For example, a ninko is an invisible fox spirit that human beings can only perceive when it possesses them. Physically, kitsune are noted for having as many as nine tails. Generally, a greater number of tails indicates an older and more powerful fox; in fact, some folktales say that a fox will only grow additional tails after it has lived 100 years. One, five, seven, and nine tails are the most common numbers in folk stories. When a kitsune gains its ninth tail, its fur becomes white or gold. These kyūbi no kitsune (九尾の狐, nine-tailed foxes) gain the abilities to see and hear anything happening anywhere in the world. Other tales credit them with infinite wisdom (omniscience). After reaching 1,000 years of age and gaining its ninth tail, a kitsune turns a golden color, becoming a 'Tenko' (天狐, "heavenly fox"/"celestial fox"), the most powerful form of the kitsune, and then ascends to the heavens. A kitsune may take on human form, an ability learned when it reaches a certain age—usually 100 years, although some tales say 50. As a common prerequisite for the transformation, the fox must place reeds, a leaf, or a skull over its head. Common forms assumed by kitsune include beautiful women, young girls, elderly men, and even young boys. These shapes are not limited by the fox's age or gender, and a kitsune can duplicate the appearance of a specific person. Foxes are particularly renowned for impersonating beautiful women. Common belief in medieval Japan was that any woman encountered alone, especially at dusk or night, could be a fox. Kitsune-gao or fox-faced refers to human females who have a narrow face with close-set eyes, thin eyebrows, and high cheekbones. Traditionally, this facial structure is considered attractive, and some tales ascribe it to foxes in human form. Variants on the theme have the kitsune retain other foxlike traits, such as a coating of fine hair, a fox-shaped shadow, or a reflection that shows its true form. In some stories, kitsune have difficulty hiding their tails when they take human form; looking for the tail, perhaps when the fox gets drunk or careless, is a common method of discerning the creature's true nature. A particularly devout individual may even be able to see through a fox's disguise merely by perceiving them. Kitsune can also be exposed while in human form by their fear and hatred of dogs, and some become so rattled by their presence that they revert to the form of a fox and flee. Other supernatural abilities commonly attributed to the kitsune include possession, generating fire or lightning, willful manifestation in the dreams of others, flight, invisibility, and the creation of illusions so elaborate as to be almost indistinguishable from reality. Some tales speak of kitsune with even greater powers, able to bend time and space, drive people mad, or take fantastic shapes such as an incredibly tall tree or a second moon in the sky. Other kitsune have characteristics reminiscent of vampires or succubi and feed on the life or spirit of human beings, generally through sexual contact. Inari Ōkami and its fox spirits help the blacksmith Munechika forge the blade kogitsune-maru (Little Fox) at the end of the 10th century. The legend is the subject of the noh drama Sanjō Kokaji. Kitsunetsuki (Japanese: 狐憑き, 狐付き), also written kitsune-tsuki, literally means "the state of being possessed by a fox". The victim is usually a young woman, whom the fox enters beneath her fingernails or through her breasts. In some cases, the victims' facial expressions are said to change in such a way that they resemble those of a fox. Japanese tradition holds that fox possession can cause illiterate victims to temporarily gain the ability to read. Though foxes in folklore can possess a person of their own will, kitsunetsuki is often attributed to the malign intents of hereditary fox employers. In Japan, kitsunetsuki was noted as a disease as early as the Heian period and remained a common diagnosis for mental illness until the early 20th century. Possession was the explanation for the abnormal behavior displayed by the afflicted individuals. In the late 19th century, Dr. Shunichi Shimamura noted that physical diseases that caused fever were often considered kitsunetsuki. The belief has lost favor, but stories of fox possession still occur, such as allegations that members of the Aum Shinrikyo cult had been possessed. In medicine, kitsunetsuki is a culture-bound syndrome unique to Japanese culture. Those who suffer from the condition believe they are possessed by a fox. Symptoms include cravings for rice or sweet adzuki beans, listlessness, restlessness, and aversion to eye contact. Kitsunetsuki is similar to but distinct from clinical lycanthropy. In folk religion, stories of fox possession can be found in all lands of Japan. Those possessed by a fox are thought to suffer from a mental illness-like condition. 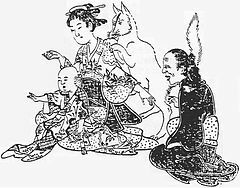 There are families that tell of protective fox spirits, and in certain regions, possession by a kuda-gitsune, osaki, yako, and hitogitsune are also called "kitsunetsuki." These families are said to have been able to use their fox to gain fortune, but marriage into such a family was considered forbidden as it would enlarge the family. They are also said to be able to bring about illness and curse the possessions, crops, and livestock of ones that they hate, and as a result of being considered taboo by the other families, it has led to societal problems. The great amount of faith given to foxes can be seen in how, as a result of the Inari belief where foxes were believed to be Inari no Kami or its servant, they were employed in practices of dakini-ten by mikkyō practitioners and shugendō practitioners and in the oracles of miko and other practitioners, and the customs related to kitsunetsuki can be seen as having developed in such a religious background. 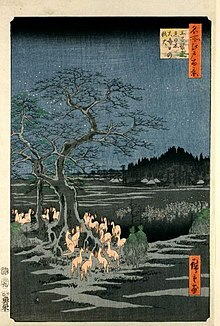 "Kitsunebi on New Year's Night under the Enoki Tree near Ōji" in the One Hundred Famous Views of Edo by Hiroshige. Each fox has a kitsunebi floating close to their face. Depictions of kitsune or their possessed victims may feature round white balls known as hoshi no tama (ほしのたま, star balls). Tales describe these as glowing with kitsunebi. Some stories identify them as magical jewels or pearls. When not in human form or possessing a human, a kitsune keeps the ball in its mouth or carries it on its tail. Jewels are a common symbol of Inari, and representations of sacred Inari foxes without them are rare. The fox later saves his life by leading him past a band of armed robbers. 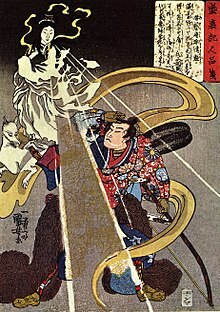 Inari Ōkami appears to a warrior accompanied by a kitsune. This portrayal shows the influence of Dakiniten concepts from Buddhism. 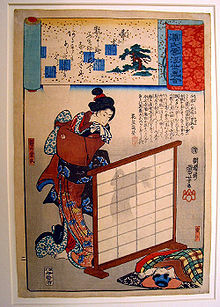 Print by Utagawa Kuniyoshi. Embedded in Japanese folklore as they are, kitsune appear in numerous Japanese works. Noh, kyogen, bunraku, and kabuki plays derived from folk tales feature them, as do contemporary works such as anime, manga and video games. Japanese metal idol band Babymetal refer to the kitsune myth in their lyrics and include the use of fox masks, hand signs, and animation interludes during live shows. Western authors of fiction have also made use of the kitsune legends. Kitsune are associated with Inari, the Shinto deity of rice. This association has reinforced the fox's supernatural significance. Originally, kitsune were Inari's messengers, but the line between the two is now blurred so that Inari Ōkami may be depicted as a fox. Likewise, entire shrines are dedicated to kitsune, where devotees can leave offerings. Fox spirits are said to be particularly fond of a fried sliced tofu called aburage, which is accordingly found in the noodle-based dishes kitsune udon and kitsune soba. Similarly, Inari-zushi is a type of sushi named for Inari Ōkami that consists of rice-filled pouches of fried tofu. There is speculation among folklorists as to whether another Shinto fox deity existed in the past. Foxes have long been worshipped as kami. Inari's kitsune are white, a color of good omen. They possess the power to ward off evil, and they sometimes serve as guardian spirits. 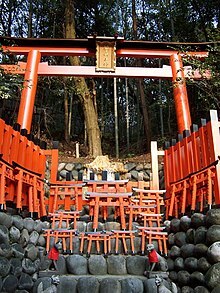 In addition to protecting Inari shrines, they are petitioned to intervene on behalf of the locals and particularly to aid against troublesome nogitsune, those spirit foxes who do not serve Inari. Black foxes and nine-tailed foxes are likewise considered good omens. Kitsune are often presented as tricksters, with motives that vary from mischief to malevolence. Stories tell of kitsune playing tricks on overly proud samurai, greedy merchants, and boastful commoners, while the crueler ones abuse poor tradesmen and farmers or devout Buddhist monks. Their victims are usually men; women are possessed instead. For example, kitsune are thought to employ their kitsunebi to lead travelers astray in the manner of a will o' the wisp. Another tactic is for the kitsune to confuse its target with illusions or visions. Other common goals of trickster kitsune include seduction, theft of food, humiliation of the prideful, or vengeance for a perceived slight. My father lived here before me, sir, and by now I have many children and grandchildren. They get into a lot of mischief, I'm afraid, and I'm always after them to stop, but they never listen. And now, sir, you're understandably fed up with us. I gather that you're going to kill us all. But I just want you to know, sir, how sorry I am that this is our last night of life. Won't you pardon us, one more time? If we ever make trouble again, then of course you must act as you think best. But the young ones, sir — I'm sure they'll understand when I explain to them why you're so upset. We'll do everything we can to protect you from now on, if only you'll forgive us, and we'll be sure to let you know when anything good is going to happen!" Other kitsune use their magic for the benefit of their companion or hosts as long as the human beings treat them with respect. 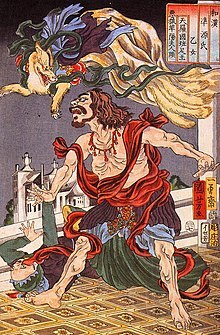 As yōkai, however, kitsune do not share human morality, and a kitsune who has adopted a house in this manner may, for example, bring its host money or items that it has stolen from the neighbors. Accordingly, common households thought to harbor kitsune are treated with suspicion. 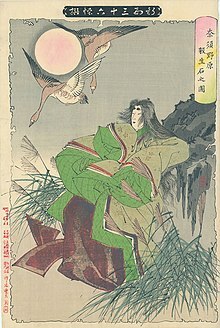 Oddly, samurai families were often reputed to share similar arrangements with kitsune, but these foxes were considered zenko and the use of their magic a sign of prestige. Abandoned homes were common haunts for kitsune. One 12th-century story tells of a minister moving into an old mansion only to discover a family of foxes living there. They first try to scare him away, then claim that the house "has been ours for many years, and ... we wish to register a vigorous protest." The man refuses, and the foxes resign themselves to moving to an abandoned lot nearby. Other stories tell of kitsune marrying one another. 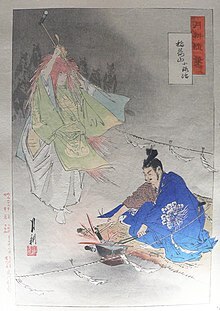 Rain falling from a clear sky — a sunshower — is called kitsune no yomeiri or the kitsune's wedding, in reference to a folktale describing a wedding ceremony between the creatures being held during such conditions. The event is considered a good omen, but the kitsune will seek revenge on any uninvited guests, as is depicted in the 1990 Akira Kurosawa film Dreams. Stephen Turnbull, in "Nagashino 1575", relates the tale of the Takeda clan's involvement with a fox-woman. The warlord Takeda Shingen, in 1544, defeated in battle a lesser local warlord named Suwa Yorishige and drove him to suicide after a "humiliating and spurious" peace conference, after which Shingen forced marriage on Suwa Yorishige's beautiful 14-year-old daughter Lady Koi—Shingen's own niece. Shingen, Turnbull writes, "was so obsessed with the girl that his superstitious followers became alarmed and believed her to be an incarnation of the white fox-spirit of the Suwa Shrine, who had bewitched him in order to gain revenge." When their son Takeda Katsuyori proved to be a disastrous leader and led the clan to their devastating defeat at the battle of Nagashino, Turnbull writes, "wise old heads nodded, remembering the unhappy circumstances of his birth and his magical mother". ^ Casal, U.A. The Goblin Fox and Badger and Other Witch Animals of Japan. Nanzan University Press. pp. 1–93. ^ Gubler, Greg. "Kitsune: The Remarkable Japanese Fox". Southern Folklore Quarterly. 38 (2): 121–134. ^ Bargen, Doris G. (1997). A woman's weapon: spirit possession in the Tale of Genji. Honolulu: University of Hawaii Press. p. 292. ISBN 9780824818586. ^ a b Goff, Janet (April 1997). "Foxes in Japanese culture: beautiful or beastly?" (PDF). Japan Quarterly. 44 (2). ^ "Kitsune, Kumiho, Huli Jing, Fox". 2003-04-28. Retrieved 2006-12-14. ^ a b c 民俗学研究所編, ed. (1951). 民俗学辞典. 東京堂. pp. 137–8. ncid BN01703544. ^ Heine, Steven (1999). Shifting Shape, Shaping Text: Philosophy and Folklore in the Fox Koan. University of Hawai'i Press. p. 153. ISBN 978-0-8248-2150-0. ^ Blacker, Carmen (1999). The Catalpa Bow: A Study of Shamanistic Practices in Japan (PDF). Routledge. p. 52. ISBN 978-1-873410-85-1. ^ Miyake-Downey, Jean. "Ten Thousand Things". Kyoto Journal. Archived from the original on April 6, 2008. ^ Haviland, William A. (2002). Cultural Anthropology (10th ed.). Wadsworth. pp. 144–5. ISBN 978-0155085503. ^ a b c d e 宮本袈裟雄他 (1980). 桜井徳太郎編 (ed.). 民間信仰辞典. 東京堂出版. pp. 97–98. ISBN 978-4-490-10137-9. ^ a b c 佐藤米司他 (1977). 稲田浩二他編 (ed.). 日本昔話事典. 弘文堂. pp. 250–1. ISBN 978-4-335-95002-5. ^ "Metal Hammer UK issue 273". Metal Hammer. 2015-07-21. Retrieved 2015-08-14. ^ Johnson, Kij (2001). The Fox Woman. Tom Doherty. ISBN 978-0-312-87559-6. ^ Lackey, Mercedes; Edghill, Rosemary (2001). Spirits White as Lightning. Baen Books. pp. 91–. ISBN 978-0-671-31853-6. ^ Highbridge, Dianne (1999). In the Empire of Dreams. New York: Soho Press. ISBN 978-1-56947-146-3. ^ Yoshitori, Tsukioka. "from the series One hundred aspects of the moon". National Gallery of Victoria, Australia. Archived from the original on 2016-08-26. Retrieved 2016-04-25. ^ Hall 2003, p. 137 the Yoshida priest in question was Yoshida Kanemi (1535–1610), then head priest at the Yoshida Shrine in Kyoto. ^ Vaux, Bert (December 1998). "Sunshower summary". Linguist. 9 (1795). A compilation of terms for sun showers from various cultures and languages. ^ Blust, Robert (1999). "The Fox's Wedding". Anthropos. 94 (4/6): 487–499. JSTOR 40465016. ^ Turnbull, Stephen (2000). Nagashino 1575. Osprey. ISBN 978-1-84176-250-0. Addiss, Stephen (1985). Japanese Ghosts & Demons: Art of the Supernatural. New York: G. Braziller. ISBN 978-0-8076-1126-5. Ashkenazy, Michael (2003). Handbook of Japanese Mythology. Santa Barbara, California: ABC-Clio. ISBN 978-1-57607-467-1. Hall, Jamie (2003). Half Human, Half Animal: Tales of Werewolves and Related Creatures. AuthorHouse. ISBN 978-1-4107-5809-5. OCLC 54410012. Hamel, Frank (2003). Human Animals. Kessinger. ISBN 978-0766167001. Hearn, Lafcadio (2005). Glimpses of Unfamiliar Japan. Project Gutenberg. ISBN 978-1604247480. Nozaki, Kiyoshi (1961). Kitsuné — Japan's Fox of Mystery, Romance, and Humor. Tokyo: The Hokuseidô Press. Smyers, Karen Ann (1999). The fox and the jewel: shared and private meanings in contemporary Japanese inari worship. University of Hawaii Press. ISBN 978-0824821029. Tyler, Royall (1987). Japanese Tales. Pantheon Books. ISBN 978-0-394-75656-1. Bathgate, Michael (2004). The Fox's Craft in Japanese Religion and Folklore: Shapeshifters, Transformations, and Duplicities. Routledge. ISBN 978-0-415-96821-8. Wikimedia Commons has media related to Kitsune. Kitsune, Kumiho, Huli Jing, Fox – Fox spirits in Asia, and Asian fox spirits in the West An extensive bibliography of fox-spirit books.